Centrifugal immersion pump Caravan 12 V, Capacity: 18 l/min, Prevalence: 2 m, Power consumption: 2 A, Hose connector diameter: 11 mm. Immersion centrifugal pump suitable for pumping water, waste water, diesel fuel and various chemical products. 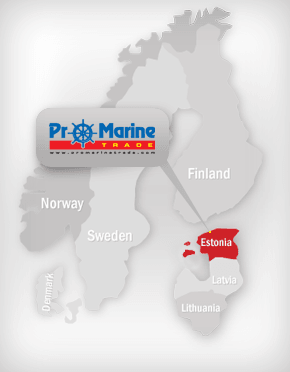 Designed with a shape that can fit into the most narrow confined spaces, also inside fuel or water tanks. Capacity: 18 l/min, Consumption: 7 A, Power: 12 V, Height: 166 mm, Diameter: 38 mm, Weight: 500 grams. Designed to be installed aligned with the tank base; it's not a self-priming pump. Capacity: 6,6 l/min, Power: 12 V. Dimensions: 88 x 45 mm. Hose connector diameter: 11 mm. Centrifugal submersible bilge pump Europump 300 with CE certification. Capacity: 16 l/min, Power: 12 V, Consumption: 1,4 A, Hose connector diameter: 19 mm. Pump dimensions: 58 x 82 mm. Automatic bilge pump Europump 600. Capacity: 38 l/min, Power: 12 V, Power consumption: 4 A, Hose connector diameter: 20/30 mm. Dimensions: 120 x 138 mm. Automatic bilge pump Elephant 500, Capacity: 32 l/min, Power: 12 V, Hose adaptor: 19 mm. Automatic bilge pump Elephant 750, Capacity: 50 l/min, Power: 12 V, Hose adaptor: 19 mm. Automatic bilge pump Elephant 1100, Capacity: 75 l/min, Power 12 V, Hose adaptor: 29 mm. 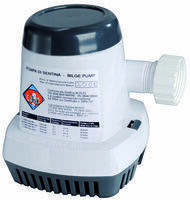 Europump II 550 GPH, Maximum capacity: 32 l/min, Power: 12 V, Pipe diameter: 29 mm, Dimensions: 60 x 93 mm. 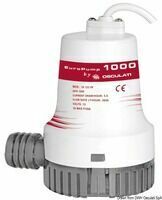 Europump II 1100 GPH, Maximum capacity: 60 l/min, Power: 12 V, Pipe diameter: 29 mm, Dimensions: 60 x 107 mm. Europump II 800 GPH, Maximum capacity: 51 l/min, Power: 12 V, Pipe diameter: 19 mm, Dimensions: 88 x 120 mm. Europump II 1000 GPH, Maximum capacity: 64 l/min, Power: 12 V, Pipe diameter: 29 mm, Dimensions: 88 x 120 mm. Europump II 1500 GPH, Maximum capacity: 96 l/min, Power: 12 V, Pipe diameter: 29 mm, Dimensions: 120 x 150 mm. 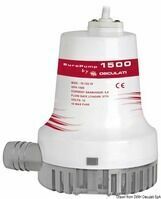 Europump II 1500 GPH, Maximum capacity: 96 l/min, Power: 24 V, Pipe diameter: 29 mm, Dimensions: 120 x 150 mm. 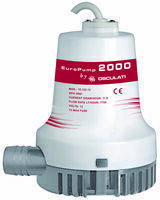 Europump II 2000 GPH, Maximum capacity: 128 l/min, Power: 12 V, Pipe diameter: 29 mm, Dimensions: 120 x 150 mm. Europump II 3000 GPH, Maximum capacity: 192 l/min, Power: 12 V, Pipe diameter: 29 mm, Dimensions: 132 x 180 mm. 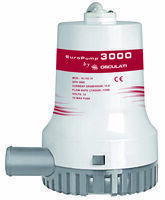 Europump II 3000 GPH, Maximum capacity: 192 l/min, Power: 24 V, Pipe diameter 29 mm. Dimensions: 132 x 180 mm. Automatic bilge pump Atwood Sahara S500. CE certification, permanent-magnet motor, stainless steel shaft, watertight electrical cables; permanent lubricating bearings; pump Snap-In removal from the base. Capacity: 32 l/min, Hose connector diameter: 19 mm, Power: 12 V, Power consumption: 1,5 A. Automatic bilge pump Atwood Sahara S750. CE certification, permanent-magnet motor, stainless steel shaft, watertight electrical cables; permanent lubricating bearings; pump Snap-In removal from the base. Capacity: 48 l/min, Hose connector diameter: 19 mm, Power: 12 V, power consumption: 3 A. Automatic bilge pump Atwood Sahara S1100. EC certification, permanent-magnet motor, stainless steel shaft, watertight electrical cables; permanent lubricating bearings; pump Snap-In removal from the base. Capacity: 70 l/min, Hose connector diameter: 29 mm, Power: 12 V, Power consumption: 4 A. Pump Rule, Model 1500, Capacity: 100 l/min, S/S shaft, motor watertight, teflon gland. 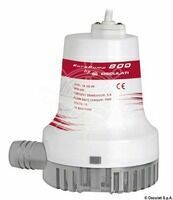 Height: 150 mm, diameter: 110 mm, Hose connector diameter: 29 mm, Power: 12 V, Power consumption: 7 A.
Bilge pump Rule 3700. Long lasting Rule motor fitted with permanent lubricating bearings and water cooling system; dual insulation, drastically reducing the possibility of electrolysis on the shaft; fitted with acetal body and snap-in base. Capacity: 237 l/min, Height: 184 mm, diameter: 120 mm, Hose connector diameter: 38 mm, Power: 12 V, Consumption: 15.5 A.
Bilge pump Rule 4000. 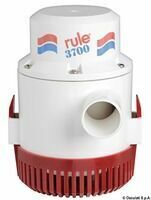 Long lasting Rule motor fitted with permanent lubricating bearings and water cooling system; dual insulation, drastically reducing the possibility of electrolysis on the shaft; fitted with acetal body and snap-in base. Capacity: 256 l/min, Height: 197 mm, diameter: 120 mm, Hose connector diameter: 50 mm, Power: 24 V, Consumption: 7 A.
Whale, Orca pump GPH 500. High performance; easy installation; very compact and can be easily inspected; hydrocarbon resistant body; large built-in filter on the casing, which provides great capacity even with debris; EC type approved in accordance with ISO 8849 standards; Power: 12 V, Consumption: 1,5 A, Hose connector diameter: 19 mm, Dimensions: 83 x 102 x 78,5 mm. Whale, Orca pump GPG 950. High performance; easy installation; very compact and can be easily inspected; hydrocarbon resistant body; large built-in filter on the casing, which provides great capacity even with debris; EC type approved in accordance with ISO 8849 standards; Power: 12 V, Consumption: 3,5 A, Hose connector diameters: 25 and 28.5 mm, Dimensions: 109 x 135 x 103 mm. Whale Supersub 650 GPH smart submersible automatic bilge pump. Low profile automatic pump suitable for limited spaces. Fitted with integrated field sensor switches, no maintenance required. Excellent functioning even in case of dirt, oil, fuel, etc. Easy-access filter. Power: 12 V, Capacity: 40 l/min, Consumption: 3.4 A, Hose connector: 19 mm. 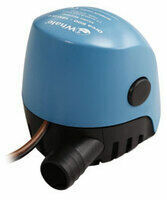 Whale Supersub 1100 GPH smart submersible automatic bilge pump. Low profile automatic pump suitable for limited spaces. Fitted with integrated field sensor switches, no maintenance required. Excellent functioning even in case of dirt, oil, fuel, etc. Easy-access filter. Power: 12 V, Capacity: 69 l/min, Consumption: 4.3 A, Hose connector: 25 and 28 mm. Automatic bilge pump. Very compact, with integrated electronic level sensor. ABS body, stainless steel shaft. Reduced electricity consumption. Removable from base with snap coupling. CE 94/25 Certified by RINA to norm 28846/28849. Capacity: 48 l/min, Power 12 V, Hose adaptor: 19 mm. Johnson bilge pump L450. Motor can be removed for maintenance or replacement simply without any tools, Check valve, fittings 90° and straight 19 mm discharge port included. Power: 12 V, Capacity: 40 l/min, Consumption: 2.5 A; Fuse size: 5 A, Dimensions: 70 mm x 110 mm. 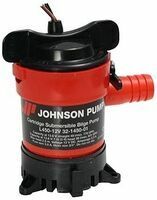 Johnson bilge pump L550. Motor can be removed for maintenance or replacement simply without any tools, Check valve, fittings 90° and straight 19 mm discharge port included. Power: 12 V, Capacity: 59 l/min, Consumption: 2.5 A; Fuse size: 5 A, Dimensions: 70 mm x 112 mm.